I've got a sneaky way you can enjoy being just a little more plant-based for taco night. I know "plant-based" eating is the biggest food trend of 2018. I know it because I read it in a magazine last week. Which makes me 200% more hip than usual. But in my house, meat-based eating is still what's expected. So now I'm back to my usual baseline of un-hipness, in case we're keeping score here. I am not sure my kids would balk if dinner centred around a grain or legume source, but I am relatively sure my partner would suddenly start needing to "work late" more regularly. He just can't conceive of a main meal that doesn't include some meat source. To him, it's not dinner if it doesn't include meat. I might be a wee bit dramatic here but the disappointment of a dinner you don't like after a long day is, to me, a trauma I don't choose to inflict on the ones I love. Especially after a long, cold February day. I will pause to state that the tone of this blog so far might suggest I consider it my feminine responsibility to cater to my husband's whims. I certainly don't. He does more dishes and laundry than I ever do. He tends, honestly, to tidy up after me as I pass through the house not unlike the Tasmanian Devil of Looney Tunes. Or Pig Pen from Charlie Brown. But I have the cooking skills. What takes me 20 minutes might take him an hour. And I work from home. So dinner, and really most cooking, is more efficient if I do it. So, for us, becoming more plant-based has so far meant decreasing the amount of meat we eat rather than eliminating it altogether. I try to use less meat in recipes and serve more veggie and grains on our plates, with meat as more of an accent. These tacos are one such brainchild. My kids love tacos. I don't love tacos. I mean, I'm OK eating them. It's the chopping, chopping, chopping, one million garnishes, grating cheese, tacos all over the floor that I don't like. And all that work and mess in the name of a meal that's, well, not exactly a nutrition powerhouse? Sort of grates on my nerves. Pardon the cheese pun. Grating cheese is literally my least favourite cooking chore. So for this most recent taco night I wanted to make a taco that was worthy of chopping, chopping, grating, garnishing, cleaning, and secretly wishing I were eating a steak alone in a restaurant. This taco filling was a HUGE success. Telling my family what was in it didn't even invoke the usual "What?! Gross!" and betrayed expressions. It was that good. I will definitely be putting this into our regular rotation. I will just get someone else to grate the cheese. Betcha nobody notices this taco night is actually super good for them. Tomato, scallion, avocado, cilantro and/or favourite toppings. Saute grated onion and zucchini 4-5 minutes until volume is reduced & texture is less watery. Add garlic & lentils; saute an additional 1-2 minutes. Using a potato masher, lightly mash the lentils into the mixture so they are less defined. Add chili powder, cumin & paprika and saute 1 more minute to gently cook spices. Push veggie mixture to sides & add turkey to pan, letting it sear a bit before turning/mixing. Saute about 4-5 minutes to brown lightly, mixing with veggies gradually. Add oregano, thyme, ketchup, soy and water. Bring mixture to a simmer and cook, stirring frequently, until liquid is reduced to desired texture, about 10 minutes. Add more water if mixture seems too tight. Finish with salt, pepper & fresh cilantro, adding more water/ketchup if needed to create a saucier mix. Serve in warmed shells with cheese, sour cream or plain yogurt, avocado and salsa! *You can use tomato passata or tomato paste, or even skip the tomato altogether but ketchup contains the perfect bit of vinegar, sugar and tomato flavour that helps pull your taco sauce together. Promise. 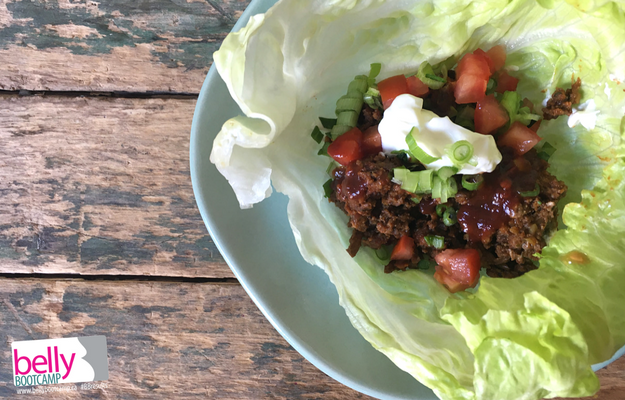 **Once again, you can omit the soy sauce and use more salt for seasoning, but the soy + ketchup combination is a classic bbq/tex-mex trick that really ups the flavour.